Let me begin by saying that I am a big fan of LinkedIn. I’ve watched its evolution with keen interest, submitted several suggestions via blog posts, directly to employees and (in a previous life) I interviewed there. So, if anyone thinks this post has malicious intent, please think otherwise. b) I have heard on several occasions from a variety of sources, a series of complaints surrounding LinkedIn’s pricing model (to which I say, hey, when you’re in high demand you can charge whatever you like) and the pernicious never ending spam that flows from its domain. 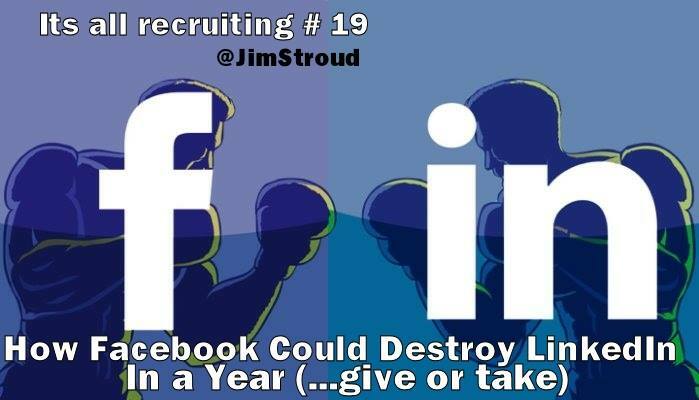 Facebook could easily (I think) take LinkedIn’s position in the hearts and minds of recruiters and candidates everywhere and in a relatively short period of time. I believe that they would want to for one simple reason – world dominance. As the #1 social network they have ownership (so to speak) of our personal lives. If they can duplicate their success with our professional lives – OMG! [insert dramatic music here] All that being said, should Facebook own our personal and professional online lives, a significant portion of their audience would leave due to privacy concerns. However, I don’t believe it would be so large an exodus that Facebook would lose its superiority over other social networks in general. 1) Facebook should tell their users that they are launching a professional network. They should advise their users that they will exporting key data from their “About” page and adding it to a separate entity. Said data being exported from Facebook would be: work and education; places you’ve lived; and details about you. Most importantly, they should give their users the options to opt out of this program with the caveat being that they can join later if they want to. Why move the data off Facebook? More often than not, the idea of recruiters sourcing from Facebook makes most people nervous of what might be found; something LinkedIn should be grateful for. Hmm… I feel a rant coming on. Facebook, when you create this competing professional network, add “powered by Facebook” somewhere in the fine print. However, the new site should not look or feel anything like Facebook. Why? You do not want your users on some subconscious level to feel skittish about using your site. Yet, you do want to be transparent about where you have received your data. a) Give tips and examples on how users can protect their anonymity on their profiles. More often than not, people will simply cut and paste their resume into the system; thus making it easy for clever sourcers to quite possibly figure out who they are. b) Give users the option to make their data public on your professional network as well. d) Give users the ability to turn “on” and “off” their profiles on the professional network, In this way, recruiters will not be able to find their profile in the first place. 3.) Now here is where Facebook’s professional network would capture the hearts of recruiters; make your professional network free to search and free to contact public candidates (although the candidate can refuse contact at his or her discretion). Recruiters can send one message to a candidate via chat (i.e job description and/or a limited amount of text. Say… 200 characters). Should the candidate want to hear more, they can release their contact info to the recruiter who would pay to access it. In this way, recruiters only pay to connect with passive candidates who have a genuine interest in moving forward. Alternately, the candidate can block people from ever approaching them again on the professional network. To which I reply, possibly… maybe… but, probably not. # Millennials job hop a lot. The ability to search for work anonymously and retain complete control of their information would be most appealing. For that matter, executives open to new adventures would find this intriguing as well. # Top talent that is constantly hounded by recruiters would appreciate having a button that can make them virtually invisible to recruiters as well; provided that they take measures to cloak themselves elsewhere. So, what do you think of my strategy? Is it the total game changer I think it could be? Leave a comment below and share your thoughts? Over the past decade, Jim Stroud has built an expertise in sourcing and recruiting strategy, public speaking, lead generation, video production, podcasting, online research, competitive intelligence, online community management, and training. He has consulted for such companies as Microsoft, Google, MCI, Siemens, Bernard Hodes Group (acquired by Findly) and a host of startup companies. Presently, Jim Stroud serves Randstad Sourceright as its Global Head of Sourcing and Recruiting Strategy. In that role, he alleviates the sourcing headaches of Randstad clients worldwide. Jim Stroud has created and sold five online properties, managed an award-winning blog, published a weekly newsletter for jobseekers, a recruiter training magazine and co-hosted a popular technology podcast. Jim Stroud has also produced multiple web series devoted to such topics as: job search, recruiting, technology and language learning. Jim Stroud has been quoted by such publications as Globe and Mail, US News and World Report, Wall Street Journal and The Atlanta Journal and Constitution. Monster.com, Entrepreneur Magazine, Black Enterprise, and The HR Examiner have all cited Jim Stroud for his digital influence. Jim Stroud also served as the emcee of SourceCon, the premier global conference on sourcing for three consecutive years. He has also presented as a keynote speaker at Sourcing Summit Europe, Sourcing Summit Asia, the Australasian Talent Conference, Recruiters Hub NZ, and TRU London. Jim Stroud is the author of 5 HR related books, producer of the "Its all recruiting" podcast and the YouTube series - "The Jim Stroud Show." More details highlighting his career and his work history can be found on his blog - JimStroud.com.